If you don't have to pay full price for the same service, why would you? My Missionary Shipping is very pleased to finally be able to bring you a discounted domestic shipping service. We are (to our knowledge) the first and only shipping company specializing in shipping to Missionaries now offering Domestic and International discounted shipping options to customers in all 50 States. This makes My Missionary Shipping the only truly Global Missionary Shipping company on the planet! Click here to sign up to receive additional news and information from My Missionary Shipping. Click on the "Domestic" tab at the top and bottom of any page. Scroll down to the automated "Account Request Form" for first time visitors. Fill out the form and submit it to be set up with your Domestic Shipping Portal Membership. You will receive an email back from My Missionary Shipping with your confirmation of membership completion. At that time you will be able to log into the shipping portal. Follow the provided tutorial of how to log into the shipping portal and get your rate and also how process your domestic shipments. Once completed the shipping label will pop up on your computer. Print it out, and attach it to your box. You then have several options, you can either give it to any mail person you see, or schedule a free pickup directly with the USPS right from your home or business, or you can drop it off at any US Post Office. (If you choose to drop it off, no standing in line is necessary, since it already has it's shipping label and the postage is pre-paid, you only need to walk to the counter and give it to a Postal worker, say thank you and walk away. Payment for your shipment will be done automatically through InXpress. Please fill out this form and submit it to request your free membership and access to your shipping portal. We also understand if you are uncomfortable submitting this information through this embedded form due to the fact that we ask for your payment information in the form. Here is a link to the same form but on a stand alone format that you can also see has the security showing on the page. Click here to be taken to the Membership Request Form. Members Log in to the Domestic Shipping Portal Here. If you don't have a username and password yet please fill in the membership request form below. ON December 28, 2016 there is a new user interface for all domestic customers. The new video tutorial showing how to use the new system is below. 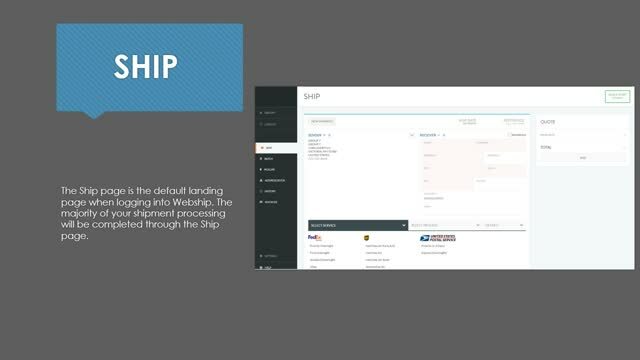 The video below will show you a "Quick Start" for shipping in your new USPS Shipping system. This video below gives you an overall review for the entire shipping system. See some Rate Comparisons toward the bottom of this page. we would have paid if we took our box to the Post Office and paid them there $12.65. The example on the right shows what we paid through the discounted rates with My Missionary Shipping. $5.66. The service level is the USPS's Priority (1 to 3 days) service.